The name Cuddy carries a lot of weight in the Canadian music world thanks to Blue Rodeo's Jim Cuddy. Now, Jim's son Devin Cuddy is preparing to release a new album with his band. Kitchen Knife will be out on July 29 through Cameron House Records. 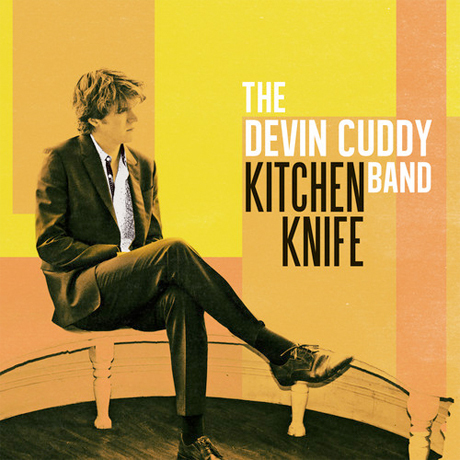 This is the Devin Cuddy Band's sophomore album, following 2012's Juno-nominated Volume One. It was produced by Blue Rodeo member Greg Keelor at his Lost Cause home studio, and his influence apparently resonates throughout the album. "I brought all the new tunes to the studio, so the band hadn't played most of them yet," Cuddy said in a statement. "Each song was arranged as we heard it, very natural approach. We took more of a studio approach as opposed to the 'live off the floor' feel we have on the first record. You'll hear more instruments, bigger sounds and a more realized sense of song." The 11-song tracklist is below. At the bottom of the page, hear the rollicking honky tonk country number "Forty Four." Also below, check out the Devin Cuddy Band's upcoming Canadian tour schedule, which keeps the group busy throughout the month of July.